You are currently browsing articles tagged cocktails. 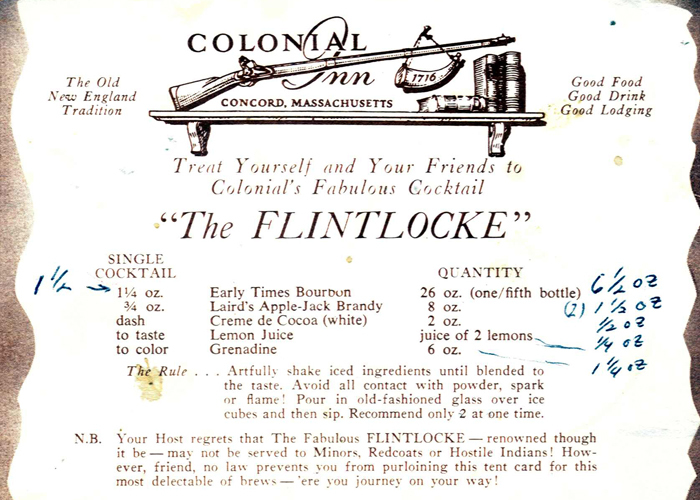 Yesterday I got an email from a reader, Mike McClure, telling me about a cocktail I’d never heard of called The Flintlocke. I asked Mike if I could post his letter (and attached recipe) and he said, “Please do! It would be great to see the Flintlocke make a comeback!” So here it is. The original recipe (as well as Mike’s adaptations) follows. If you ever wonder if your articles connect with your readers; I’d like to share with you the following. · You really helped me improve my Manhattans. (i.e. : Orange bitters vs. Angostura; Rye vs. Bourbon; etc.) BTW, Like you, I’m a big Maker’s Mark fan. Recently though I’ve been able to find really great Ryes. My favorite is George Dinkel’s Rye. (Total Wines price ~$22). · The second reason is the nostalgic tie to your father. In our family, we have a similar story. For our family, the drink is called the Flintlocke. Legend has it that back in the 1960′s; a bartender at the Colonial Inn in Concord Massachusetts entered and won a national drink contest sponsored by Laird’s (Maker of Apple Jack and Early Times bourbon). His drink was the Flintlocke. It’s similar to a Manhattan: (Bourbon, Apple Jack but also includes Crème de Cacao, lemon juice and Grenadine) Proportions have to be accurate or it will taste like bad cough syrup or worse. For the next couple of decades, the Inn featured the drink. 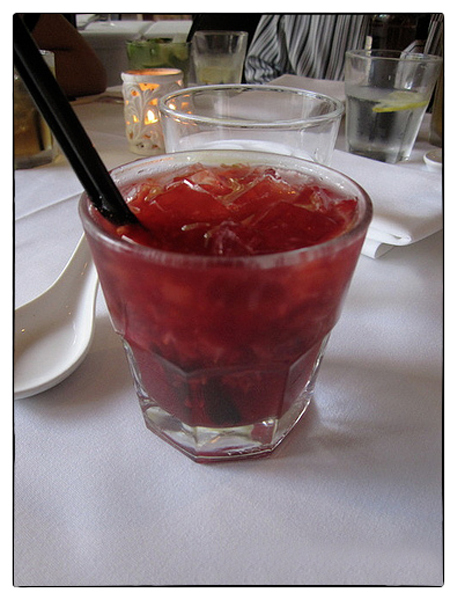 In the late sixties, my father, while dining there, spotted a ‘table-tent’ card on the table featuring this drink. He enjoyed the drink and brought home the card. Over the next few years, he perfected the mixing of the drink. I remember when my parents were having cocktail parties, Dad would make up a batch and share the recipe with their friends. (Think Christopher Walken in the opening scene of “Blast from the Past”) At future get-togethers, the friends would all compare notes with him on their own mastery of the drink. As my siblings and I reached the drinking age (I’m now 59), we carried on the tradition and have shared this with our friends and extended families. 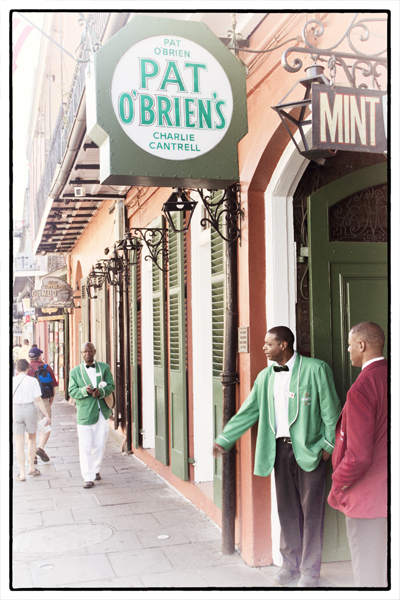 In the mid-eighties, one friend made a trip back to the Colonial Inn; only to find the drink still being featured…with the same table-tent placard. Like you, this has become our holiday seasonal drink of choice. As the family gathers at Thanksgiving and Christmas, we always make up a batch of Flintlockes; and continue to share the recipe. Our father passed away in December, 2000. In his final days, the family gathered around his bed. We had one more Flintlocke with him while eating his favorite Christmas cookies (Old fashion German Sand Tarts). To this day, we sacrilegiously referred to it as “the body and blood of our Father”; Amen. So, again, thank you for your article. Glad to know other folks have similar traditions and memories of their parents. 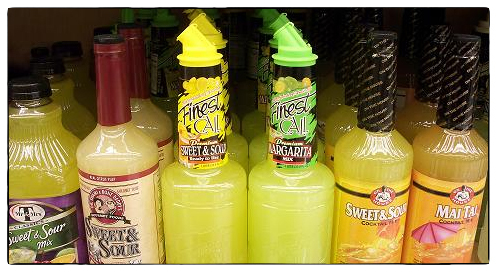 Do not, do not, do not use these mixes to make your cocktails. Yesterday I wrote about how Mexican Controy is now being distributed in the U.S. by a little company in Texas called Pura Vida. I also mentioned a story I’d written a few years ago on how to make The Best Damn Margarita Ever. The keys to that cocktail were using a 100% agave tequila, Mexican Controy, and a homemade sour mix. Thinking about all this kept me up last night. Getting a really good tequila is obvious and now you know how to get ahold of Mexican Controy. But I didn’t really say anything about the sour mix which is just as important as the spirits. First of all, if you’ve got a bottle of commercially made sweet and sour mix in your refrigerator, I want you to do the following: Go to fridge. Pick up bottle. Unscrew cap. Pour down drain. Throw bottle away. Now, to make your homemade sour mix, all you’re going to do is use equal parts freshly-squeezed citrus juice and simple syrup. The easiest thing to do is use equal parts lemon and lime juice. For instance, to make a liter of sour mix you’d combine 8 ounces lime juice, 8 ounces lemon juice, and 16 ounces simple syrup. But you can use other combinations as well. For instance, I typically use a little grapefruit juice when making a sour mix for margaritas. Maybe 4 ounces of grapefruit juice, 4 ounces lemon juice, and 8 ounces lime juice. Sometimes I’ll use blood orange juice as well. Give it a try. You’ll find whatever combination of citrus juices you use will be a lot better tasting than anything you can buy at the store. A few years back I wrote a guest blog on The Best Damn Margarita Ever for The Foodinista (which is written by Heather John, a former food/cocktail/fashion writer for the sadly missed Los Angeles Times Magazine and then Bon Appétit). I stressed in my story that there were three key ingredients to making a really, really good margarita: use a 100% agave tequila (I always use a reposado, but blanco is fine as well); make your own sweet and sour mix from fresh-squeezed Mexican limes; and use Controy, not Cointreau or Grand Marnier. As Heather and a few other readers pointed out, the only problem with my recipe is that the only place you can get Controy is Mexico. Which is why I always buy a couple of bottles to bring home when I’m down there. 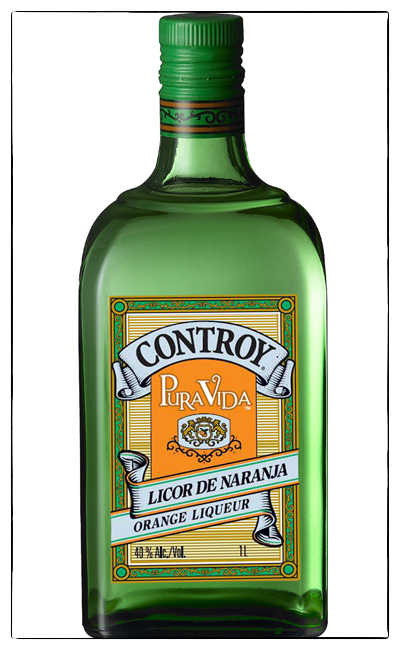 But last week I got a startling email from Chris Novostad, of Pura Vida, a small Texas-based company, who’d read my story about The Best Damn Margarita Ever and wanted to let me know that Controy—which, since its creation in 1933 has never been allowed in the states by the giant conglomerate Remy Cointreau—would now be distributed by Pura Vida in the U.S.
For now, it’s only available in Arizona, California, Colorado, Lousiana, Nevada, New Mexico, and Texas. But they’ll soon be expanding, both in other states and internationally. I can’t tell you how happy this makes me. In fact, I think I’ll make myself a Controy-based margarita to celebrate.